The out-of-control burning of an abandoned coal mine is threatening the health of thousands. Children are exposed and vulnerable and there are suggestions of corporate malfeasance. It’s visible, it’s dramatic, and it’s hurting people. It’s also coal, the energy life-blood of Australia and much of the world. Predictably, it’s a big deal in Victoria and otherwise the event has received minimal attention compared to Fukushima. This reminds us again that the great dangers of coal are made all the worse for their lack of novelty, which breeds a collective complacency and acceptance of serious hazards. For the last 15 days, an energy disaster of spectacular proportions has been unfolding in the La Trobe valley region of Victoria, in south-eastern Australia. Following terrible bushfires that accompanied our record-breaking, scorching hot summer, an abandoned section of the Morwell brown coal mine caught fire and has been burning ever since. The fire is raging across approximately 3 km of the old mine. It appears to be very difficult to control. There are (not yet officially confirmed) reports that fire-fighting equipment of the necessary calibre for such an event was removed from the old mine some time ago. Firefighters are reportedly needing to limit their exposure due to the threat of radiant heat and carbon monoxide, and also limit the input of water to prevent collapse of the mine face itself. Meanwhile residents of Morwell are suffering. This is no invisible menace. Thick smoke has blanketed the town. Ash is falling from the sky. Residents are falling ill. Local health centres are reporting a five-fold increase in respiratory complaint. School children are being billeted outside the town to protect their health, and residents at large have been recommended to leave Morwell over the weekend if possible to “get some respite”. Advice provided from the Chief Health Officer, Dr Rosmary Lester, reinforces the seriousness of the hazard , at least in the short term. Of special concern is the concentration of fine particles. The spokesperson for the Victorian EPA advises “These of course are being blown up from the mine whenever there is a west-south-westerly wind. We’re seeing PM 2.5 particles; they’re those really small particles that you can’t even see but get stuck in your lungs. They’re the ones that are of course of concern, and we ask people to bunker down, to get some respite if they can, get out of Morwell across the weekend”. To assist residents in managing the situation, the EPA has, to their great credit, quickly upgraded the provision of information from their monitoring stations to an hour-by-hour graphical and data representation on their website. It is concerning that there would appear to be no monitoring in relation to the PM 2.5 and little monitoring in relation to the PM 10. Residents will need to make inferences from the other ratings and their own observations and experiences. There are the suggestions of corporate and regulatory malfeasance in relation to the condition of the abandoned mine. This large, exposed face of coal appears to have been left largely unrehabilitated and exposed to the entirely realistic risk of bushfire, with the necessary fire-fighting equipment allegedly withdrawn. So far, the decision remains that the health hazards are manageable and evacuation is not an appropriate measure. This is a very difficult decision and an important one. As we have learned (I hope) all too well from Fukushima, evacuation itself poses grave hazards for the vulnerable and brings with it a whole host of stressors. It is completely appropriate for authorities to weigh these realities in their considerations. How tragic that the dread of radiation spurred such an over-reaction compared to the measured response on display in relation to the risk of smoke. Somewhat contradictorily, we are advised that there are unlikely to be long term health impacts of concern from this event, based on the advice, again, of Dr Rosmary Lester. I sincerely hope this to be the case and that the residents of Morwell can have their town back to normal as soon as possible. I note that this advice must co-exist with the other advice, from the same source, indicating that this is a serious acute (i.e. short-term) hazard for the most vulnerable. To the residents of Morwell, I’m thinking of you as you struggle with this event. Let’s all hope the impacts can be kept to a minimum and residents can remain in good health. This event, and what you are putting up with deserves more attention. It is my hope that the event might spur more evidence-based considerations of the relative hazards of our energy choices in future. My thanks and acknowledgement to the ABC in particular for their coverage of the event. With the Great Barrier Reef it is port dredging and ships running aground that get attention while climate change and ocean acidification are meekly accepted. 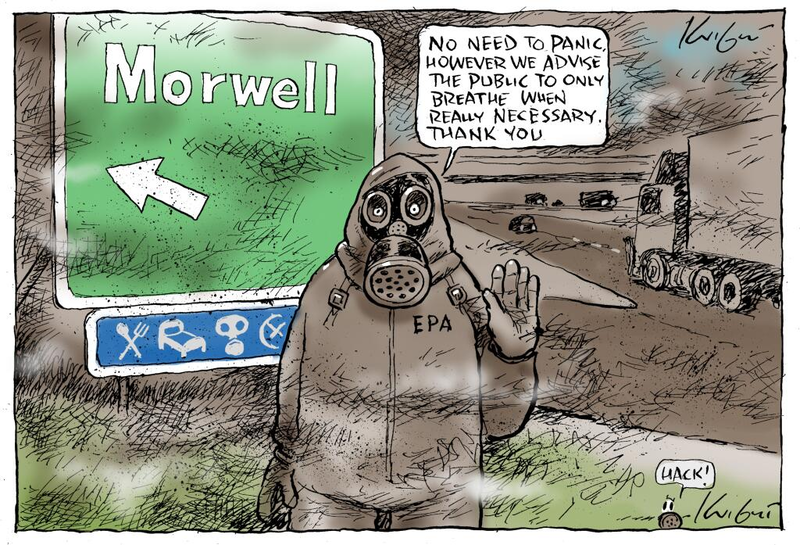 I wonder if the people of Morwell would consider Hazelwood for C2N coal-to-nuclear conversion. I understand the cooling towers use water from a lake (seemingly drought proof) as well as mine dewatering. Other gigawatt-plus thermal plant sites would need seawater cooling. The Wiki article says decommissioning in 2031 but the way we’re going it could be later. If the Morwellites don’t want nuclear and they don’t want the problems of flammable dirt I’m not sure what options are left. My hunch is we’ll accept 20 more years of burning dirt. Maybe survey them and ask them to pick Coal (BAU), Gas, or Nuclear. I can’t fathom a solar and wind hybrid replacing Hazlewood and maybe Loy Lang. That would cover a shed load of agricultural land. Just think how easy it would be to scare the hell out of people with true statements that are nevertheless misleading: coal smoke is carcinogenic (true), just one breath of burning coal smoke could cause DNA mutations that went on to become cancer (true), many of the compounds from the smoke will remain in the environment indefinitely and could pollute drinking water and food for decades (true). If you stop there, then it sounds very scary. BUT … all these statements are true but misleading. Why misleading? Because they lack quantification. Millions of people cook with coal in their houses in fireplaces that are pretty primitive. Does doing this for years raise lung cancer risks? Yes. In rough terms, risks double (http://www.ncbi.nlm.nih.gov/pubmed/22653775). What are the risks of breathing much smaller amounts of this stuff for a few weeks? The short term impacts could definitely be severe in some people, but the cancer impacts (based on studies like the one just cites) will be miniscule. It is usually cancer that the anti-nuclear movement focuses on because it seems to be the scariest. I can understand the strategy. Asthmatics could well suffer life-threatening impacts from this smoke but talking about that won’t scare anybody except asthmatics … so cancer is the go, because everybody can be scared of cancer. You are spot on Geoff. You will have noted that I only quoted the most senior health office and in relation to potential health impacts and the spokesperson from the EPA in relation to the recommendations. I took care to write nothing at all beyond this and made none of the scary, true and misleading prognostications you have identified. Could I have gone to town in the name of what I think is an important cause, that of moving urgently away from coal? Sure. Was I tempted to do so? No. Not remotely. That would be a completely reprehensible thing to do. Staring down the opportunity, I just still can’t fathom the moral vacuum in which fear-mongers must exist. Not to mention the fact that my readership on the whole is similarly upstanding and would not tolerate such an abuse. It’s a tough balancing act for health officials. Serious spikes in air pollution, as with spikes in temperate (high or low), do kill people. But panic and mass movements are also dangerous. And, as a society, we very rarely compel people to move. We even let people choose to fight a bush fire to save their house. Again this is partly because compulsion in such situations is dangerous for everybody. All of which makes the Fukushima evacuation a weird outlier. Mass psychosis is probably the best label to put on it. Since SA wind is more reliable than than that of Vic at times that will be exported. The obvious conclusion seems to be when wind is in the doldrums the Vics will burn more brown coal to keep Adelaide lights on. Out of sight out of mind. This is how Germany responded to high gas prices. Not true; polls show a clear majority of SA people support nuclear power. The images in this link cast doubt on whether Hazelwood would suit coal to nuclear conversion. That is the boilers, turbines, switchgear, powerlines, cooling pond and local workforce remain in place while the method of steam generation changes to nuclear. However if a fire lapped at the edges of a NPP the press would be hysterical rather than mildly disapproving as they are now. I suggest one reason coal lingers on apart from lack of CO2 penalties is emotional blackmail. The power plant and mines support families, schools and supermarkets all of which are at risk if dark forces want to take it away. No doubt they’ll get the external fire under control but I think the plant will operate until 2031 as planned. That is 17 years X 16 Mt CO2/y = 272 Mt of greenhouse gases. Mind you summers will have routinely hit 50C by then so we’ll need cheap power for air conditioners. If Victoria were to get a gigawatt NPP a better ex-coal mining area could be Wonthaggi 100km from the Latrobe Valley.. I guess what is different about the coal fire and the power station is the effort to remove all but the ‘invisible gas’ to use the PM’s term. Somewhere in the images are coal dryers, air blowers, particle filters, precipitators, sulphur scrubbers and fly ash bins. .Then the tall chimneys send the flue gas well above ground height to be dispersed by the wind. CO, SO2 and most particulates don’t make it to people’s lungs but every year Hazelwood spews 16 million tonnes of CO2 into the atmosphere. According to some that must be somebody else’s problem if it is a problem at all. Actually I think there was a token effort to grow algae with flue gas but it never got big. Would the Morwellians prefer a 1600 MW nuke? I suspect not. They want back the way it was for at another decade or three. I wonder what Joe Public made of last night’s piece on Fukushima by 60 Minutes. Those little radiation detectors only detect gamma rays but they can make a screaming sound to scare the pants off anybody. A typical reading was 8 uSv/h which X 8,760 is 70 mSv/y. One reading in the current evacuation zone was 30 uSv/h and the detector went crazy. Meanwhile concerned mothers are taking their kids for repeat scans perhaps while denying them healthy outdoor activities. This kind of media story will keep King Coal at the top of the pyramid for another half century while we wait for wind and solar to save us. However I suspect Joe Public was not as alarmed as 60 Minutes had hoped. Is there no limit to the depths of media ignorance on this issue? It’s astonishing that Hayes would spend so much time on a story and not bother talking to any actual experts (or perhaps she just chose to ignore them). Re the latter, Hesncke said FBR and Kruszelnicki said “Ah”… whatever that implies. Twas also announced that Tom Wigley will be on Henscke’s program some time after 10 am on Thursday 13 March. Dr Karl has surprised me for staying so deliberately ignorant on these matters. Well done to Ian. He had Robert Stone on for interview last year, and was obviously paying attention. Doctor Karl and Professor Tim obviously go whichever way the wind blows. To his credit Dr K did once say on ABC TV that reactors were very safe. I’m puzzled by the lack of energy discussion in the election for this Saturday. Some simple facts suggest it must be the elephant in the room; the imminent doubling of the gas price when gas generates 50% of SA electricity and the tanking of the State’s biggest project the OD expansion. Note Weatherill has outed himself as a nuclear opponent.